Gamblogger: $1 Million Free Roll Poker Tournament Series Has Begun! $1 Million Free Roll Poker Tournament Series Has Begun! 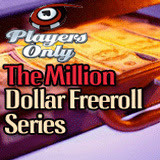 In the biggest tournament series since the re-launch of their video-rich poker room, casino and sportsbook, PlayersOnly.com has just begun its first Million Dollar Free Roll Tournament Series. A total of $1,000,000 will be awarded over the next ten months with winners of monthly finals taking away $75,000 each. Players can win their way to the monthly finals at free rolls held twice a day, at one of three cash satellites with buy-ins as low as $2, or by direct buy-in ($50). There will be special opportunities for Gold Chip players and 25 seats at the final table will be awarded in a unique Deposit Bonus Lottery. The first monthly final will be on September 30th at 9:00 pm ET. Qualifying matches began last week. The payout structure for PlayersOnly’s monthly tournaments divide the monthly prize pool so that the winner takes away $75,000 and even second and third place players win $10,000. Any PlayersOnly.com player can qualify for the monthly finals for free by winning one of 14 free roll qualifiers held each and every week. PlayersOnly.com’s tables are always busy and with this kind of money at stake they’re bound to be hopping. Those that prefer to avoid high volume free roll satellites can win their seat in the finals in cash buy-in satellites held every Tuesday, Thursday and Sunday. Players with Gold Chip loyalty points can play special qualifiers on Mondays, Wednesdays and Fridays where the buy in is ten Gold Chips. All players also have the option of simply buying in directly at the final table for $50.